Its that time of year again. Canadian Cancer Societies – The Relay for Life. This is again one week out from my competition in June but I would not miss it for the world! Please consider donating. This walk is 12 hours over night to raise money for cancer research and care. You can donate HERE. Every penny helps. Over the years I have lost many important people to Cancer. My Uncle Tom was taken far too young. My son’s grandfather again lost his battle and last year my son Jacob walked with me. Robin, Lissa, Kelly, Pam, the list goes on and on. All of these people have battled, some survived, some lost that battle. 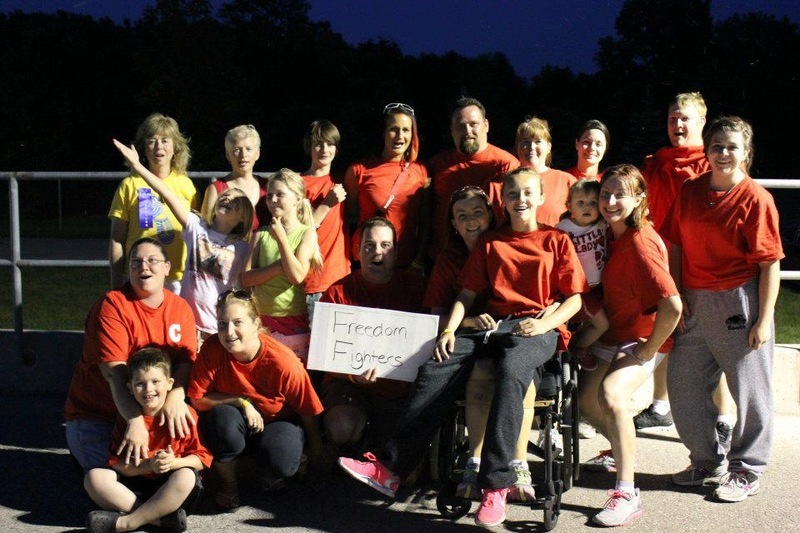 This year will mark my 4th year walking with the Freedom Fighters Team. two years ago mere weeks before the fundraiser I received the news that I had a malignant tumor in my right breast. The walk took on new meaning. Over the previous year I had lost close over 30lbs and many inches when I had enough of being over weight and decided to get fit. I took on bodybuilding, lifting weights.. Despite a return of this dreaded disease I am and remain cancer free. I will compete in my 3rd bodybuilding competition the week after the relay. I would not miss this event for the world. Weather it be a donation, joining us during the survivors lap and opening ceremonies or the purchase of a luminary on your loved ones behalf. This cause is one worth supporting. I will run for my health and the hope that everyone’s fight will someday end with the same outcome. This year we lost one of our captains. A truly amazing and inspirational lady that I came to love and admire. Two years ago she arrived at the relay mere hours after getting “new legs” having had hers amputated. During the survivors lap she walked! |It was amazing! unfortunately the organizers had not seen her still making her way around the track. As a team, The freedom fighters screamed her on. She was so strong, so amazing and so inspirational, not just in her fight but in her heartfelt love of life. She did not die directly from cancer, she was strong, a teacher and back at work. Liss taught at my son’s school. Her deteriorated immune system around so many kids had a deterimental effect on her health. She ended up with complications from pneumonia and a stroke. She was so young. It was the worst blow I can imagine. This year we walk in her memory. We walk in her love. And I can almost garuntee there are going to be butterflies and warm weather courtesy of our beautiful angel. Please join me in supporting this amazing cause. I will walk for 12 hours and remember, believe and know that no matter what I will fight and so will the doctors, nurses, patients, volunteers, caretakers, family and friends of everyone who has been affected by Cancer. You can be part of a community that takes up the fight. Please make a donation to myself or my team in support of the Canadian Cancer Society Relay For Life- with your donation, you can help us make cancer history. Previous Post8 + Weeks and Counting UpdateNext PostA post from my better half….